In the context of energy efficiency, smart metering solutions are receiving growing attention as they support the automatic collection of (fine-grained) consumption data of appliances. While the capability of a stakeholder (such as a consumer, an utility, or a third-party service) to access smart metering data can give rise to innovative services for users, it makes the control of data release and usage significantly more complex. It is thus extremely important to put in place an adequate access control mechanism that takes into account the authorization requirements of the various stakeholders. 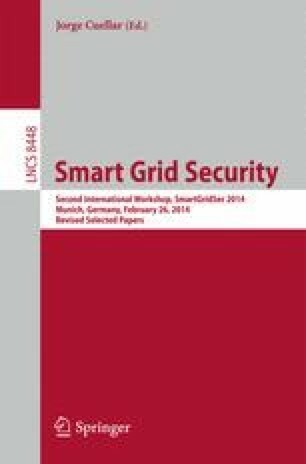 To address this issue, we propose a framework based on the Attribute Based Access Control model for the selective release of smart metering data in cloud-based solutions for smart grids. We applied our framework to a scenario proposed by Energy@Home, a non-profit association of companies with the mission of developing and promoting techniques for energy efficiency in smart homes. As a proof of concept, we implemented our approach on top of the open-source Spring Security framework. This work has partially been supported by the activity “SecSES Secure Energy Systems” of the action line ASES Smart Energy Systems of the EIT ICT Labs, and by the MIUR PRIN 2010-11 project “Security Horizons.” We are grateful to Jorge Cuéllar, the participants, and the reviewer of the “Second Open EIT ICT Labs Workshop on Smart Grid Security” for their remarks and comments that helped to improve the paper.